Dating back to 1855 when this keelless eight-oared racing boat made its appearance at Henley on Thames. Designed by Matthew Taylor, for the Royal Rowing Club, it was built, with an outer skin of bent or moulded cedar wood, bottom side upwards on the moulds. Oxford University launched a similar craft of their own, at Putney in 1857, 63 feet in length and 25 inches in beam. Over the years the dimensions and fittings varied but these were prototypes for most racing boats into the 20th century and is used in the University Boat Race crewed by a coxed eight. Hulls were made of cedar wood imported from Central America which although only three sixteenths of an inch thick could withstand pressures of 8,000 pounds below the waterline. During the 1970s experiments were made with fibreglass, and other materials, which has led to the modern rowing eight and the four which now dominate the sport.. The Hollow Paddle Board, a timber frame with plywood skin, was developed by Tom Blake in Hawaii. Around 1926, Tom Blake attempted to recreate some of the larger ancient Hawaiian solid wood Olo designs that he had restored for the Bishop Museum, Honolulu. "Strange as it may seem, three old-style Hawaiian surfboards of huge dimensions and weight have hung on the walls of the Bishop Museum in Honolulu for twenty years or more without anyone doing more than wonder how in the world these great boards were used, as they were too heavy and long to be practicable." 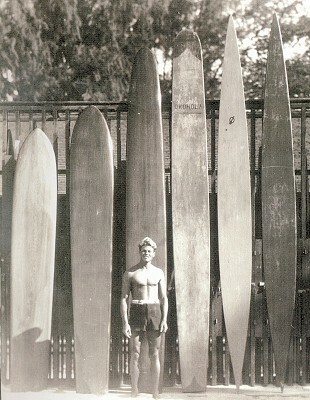 "I too wondered about these boards in the museum, wondered so much that in 1926 I built a duplicate of them as an experiment, my object being to find not a better board, but to find a faster board to use in the annual and popular surfboard paddling races held in California each summer." "As early as as 1918 Claude West had experimented to make a hollow board, chippig and gouging out a solid redwood slab and fitting a small sealed and screwed deck. The experiment was not a success; plywoods were not yet, nor plastic glues, timbers were sun dried intead of kiln dried as now, and sun-cracks quickly gaped to let in water. 'Snowy' McAllister of Manly...also experimented with chipped out boards. He, too, was unsuccessful, though he improved on the West model, also steamling the tail in the hope of gaining more speed." Blake also reported the length of this board as 14 ft 6 inches in 1935, see below. "hollow - length, 14 1/2 feet; width 20 inches; weight 120 pounds"
"Waves and Thrills at Waikiki "
" He purchased a solid slab of redwood 16' long, 2' wide and 4" thick. It weighed around 150 pounds - too heavy to be of service as a surfboard, even when shaped. So to lighten it he drilled hundreds of holes in it from top to bottom, each hole removing a cylinder of wood four inches long. Then he left the holey board season for a month. t finished up 15' long, 19" wide and 4" thick, looking like a cigar. It's weight was only 100 lbs, because it was partly hollow." The second edition of History of Surfing (1994) is dedicated to Tom Blake who died May 5, 1994, aged 92. The complete photograph, see below, notes a third length for this board of 14 ft 6 inches. There is some confusion as to these board's actual lengths. It is possible that the board's length was reduced between 1926 and 1930, due to modifications or repairs - it certainly reduced in weight..
" WORLD'S ORIGINAL HOLLOW BOARD. The long white board above was the first reproduction of the ancient Hawaiian OLO chiefs board, however it was hollow to lighten it. Duke Kahanamoku also rode this board. Thos. Blake"
Uncredited photograph and hand written notes by Tom Blake from a copy of Hawaiian Surfboard, 1935.
reproduced in Lueras, page 83. "In the later part of 1929, after three years of experimenting, I introduced at Waikiki a new type of surfboard;...but in reality the design was taken from the ancient Hawaiian type of board, also from the English racing shell." The construction of this board is unclear, in Blake's notes does "English racing shell " refer to the template, the ribbed construction or both? - built form a timber frame and covered with a layer of the newly developed marine grade ply- wood, in the manner of racing shells or canoes of the period. or some combination of these methods. Given the reported weight of only 60 pounds, one of the latter methods seems most likely. The template of this board was radically streamlined compared to it's predecessor. The application of a light skin over a ridgid frame for boats dates back to the Irish chonicle or the Innuit kayak. "It was called a 'cigar board', because a newspaper reporter thought it was shaped like a giant cigar. This board was really graceful and beautiful to look at, and in performance so so ggod that officials of the Annual surfboard Paddling Championship immediately..."
Blake, pages 51 - 52. "a light, hollow 16 footer, broke all paddle-race records at Waikiki." "The riding model, 'Okohola', came a month later (after a paddling competition), December 1929.."
" ... a riding board sixteen feet long. The new riding board was a great success and Duke Kahanamoku built his great 16 - foot hollow redwood board along about the same time. He is an excellent craftsman and shapes the lines and balance of his boards with the eye; he detects its irregularities by touch of the hand." "a reproduction of the ancient Hawaiian rider." This success of the design, primarily as a paddle board, was followed by the common hollow design of plywood covering over a light wood frame, with a bung. He rapidly incorporated current aircraft and boat building techniques into surfboard design and his design of a light timber frame covered with plywood panels resulted in a huge weight reduction. On 18th April, 1931 Thomas Edward Blake submitted three pages with a detailed drawing for a ' Water Sled'. and was subsequently granted US Patent No. 1,872,230 by the US Patents and Trademarks Office, Washington DC. Initially viewed with scepticism, the paddling advantages were emphatically demonstrated as Tom Blake dominated paddle races in California and Hawaii in the 1930’s. Aware of the life saving potential of such a craft and an enthusiastic promoter of his sport, Tom Blake gave his design international exposure by publishing the blueprints and construction details, principally in various Popular Mechanics Magazines of the period. See below, or Plans and Specifications. Publication saw the design rapidly adopted around the world, notably Australia, New Zealand, Peru and South Africa. In these countries it had an extended life due to the lag before these countries caught up with the developments in fibreglass and foam. In Australia the design first appearred as the Racing 16 and was later modified to a finned Malibu or Okinuee (1956-1958) while in New Zealand the lag was even longer and hollow Malibu boards were manufactured up to 1961. Circa 1934 Tom Blake added a small water ski type fin/skeg to one of his hollow boards. Although an significant addition, because of the emphasis on paddling, the small size relative to the board, the increased danger and the difficulty in attachment, many riders do not consider fins as a necessity. It rarely appears on Australian examples of long Hollows. Photograph and hand written caption by Tom Blake. March 1981, Volume 22, Number 3, page 37. In the area of design, although many surfers maintained an allegiance to the solid wood alaia, the pioneering of large surf at Makaha and on the North Shore saw the development in 1937 of the Hot Curl. A solid wood no-fin gun-template board with deep V bottom at the tail was built by John Kelly, Wally Froiseth and Fran Heath in Hawaii. 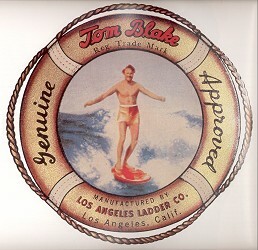 Gary Lynch noted (March 2019) that the Robert Mitchell Company built Tom Blake’s paddle and surfboards. Robert Mitchell was an Irish immigrant who partnered with Frederick Rammelsberg to open a furniture-making business in Cincinnati in the 1830s or ’40s. Mitchell & Rammelsberg incorporated in 1867. In 1881, after Rammelsberg had died, the corporate name was changed to Robert Mitchell Furniture Co. It remained in business until about 1940. Any Victorian-era furniture made by Mitchell & Rammelsberg or Robert Mitchell Furniture Co. is high-quality and prized by collectors. He stands before his redwood favourite, 11 feet long, 23 inches wide, and 31/4 inches thick, square-edged on the bottom for steadiness. Number 2, of red cedar and a foot longer, is for fast paddling. For big waves, the third, hollow - length, 14 1/2 feet; width 20 inches; weight 120 pounds - has proved easier to handle than the fourth, a reproduction of the ancient Hawaiian rider. The fifth, a light, hollow 16 footer, broke all paddle-race records at Waikiki. The last, solid and heavy, is a training board." Boards and self portrait by Thomas Edward Blake 1930. 1. This portrait introduced a portfolio of seven duo-tone surfing photographs with notes, that were also reproduced in Tom Blake's The Hawaiian Surfboard, 1935. However, these are in blue duotone, especially selected by Blake for this printing. 2. The photographs, taken from Blake's board in his home made water-proof housing, were a major inspiration to other surf photographers, notably Don James and 'Doc' Ball. 3. 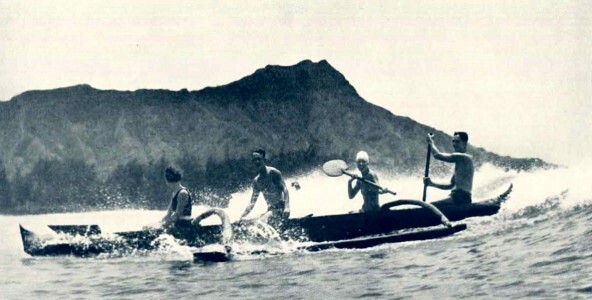 The last photograph of the portfolio is of outrigger canoe surfing - one of the passengers is aviatrix, Amelia Earhart. 4. 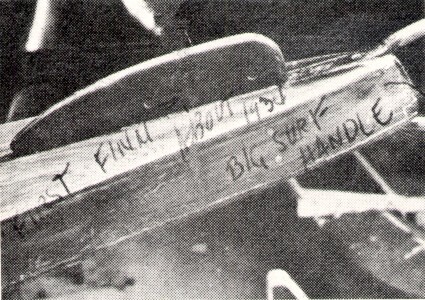 The photgraph was taken in the grounds of the Outrigger Canoe Club, Blake's boards are leaning against the member's surfboard lockers. 5. This is the first known quiver portrait. 7. Another photgraph from the same shoot, with Blake in the centre of the boards, is the more commonly reproduced version. 8. None of the hollow boards show evidence of a draining plug. This is an almost universal feature of hollow surfboards from about 1940 to the present. Structually, if the board is hollow it should have a drain or pressure plug to let out any water from dings and to equalise the pressure for climatic extremes. The Runestone Museum, 206 Broadway, Alexandria, (320) 763-3160, www.runestonemuseum.org. Admission $5. Closed Sunday mid-October to mid-May. Admission includes the Minnesota Lakes Maritime Museum next door, which includes a 40-foot replica of a Viking ship; dozens of vintage "Lady of the Lakes," ribbed-hull wooden fishing boats; and what the museum says is the first surfboard patented in the United States, by a local man named Erick G. Erickson, in 1929. I just grabbed the 1934 brochure from Thompson Bros. Boat Mfg. Co. They had two aquaplanes pictured. One is the "Hawaiian Surf Board" which is redwood 3/4 inch planks. The other is the "Hawaiian Floater." The latter is a hollow, built-up board. It had a slight V shaped bottom, 6 feet long and 28 inches wide. I have the Hawaiian Surf Board, with a great Thompson logo on it. Both are painted bright red and varnished. List price in the '34 brochure, $8.00 for the Surf Board and $12.00 for the Floater! The Argus (Junior) Thursday 3 December 1936 page? Two models - Free and Tow (Aquaplane with fin). Victoria and Albert Museum : Plywood, 2016. The Victoria and Albert Museum in London has a few Plywood surfboards on show as part of the History of Plywood. The 11ft, 7 1/2 inches toothpick pictured below is one of several boards supplied by MOBS and myself. My Toothpick dates from 1940/45. It has been bought back from Australia just after WWII to Mylor in Cornwall by Reginald Gordon Rollason. I am a curator at the Victoria and Albert Museum in London, and am working on an exhibition about the history of plywood. I am very interested in plywood surfboards, examples of which we plan to show in the exhibition. I have seen Tom Blake described in various places as the first designer to use plywood in his boards, but haven’t been able to find any definite evidence that he did in fact use plywood as a material (neither his patent nor his article about building your own surfboard seem to specify it). I was fascinated to read through the material on your very helpful website, and wondered if you are aware of any surviving Blake boards where plywood construction is definitely visible? I would be very grateful for any help or suggestions that you could give about this. Thank you for your fascinating questions. Please note the distinction between a board made by Tom Blake, a board made by a licensed company, and a board made by anyone to his design plans, which he distributed widely and never appears to have enforced his patent. The first might number about 3000 (? ), but the second were far more numerous, both largely used in Hawaii and the US. Boards constructed to Blake's design probably numbered in the 10's of thousands and were used world wide. Also, I think there are reports of some surfboards built with plywood before the mid-1920s, but as these were not marine-grade they had a short and inglorious life and were only recorded as an experimental failure. evidence that Blake did in fact use plywood as a material? Plywood was not used on the early Blake designs, in Hawaiian Surfboard (1935) the board is said to be made from mahogany and in 1937 he suggested spruce frames with African mahogany first choice for the planking- two pieces 12'' x 14ft x 0.75" for each side. Popular Mechanics Magazine , July 1937 Volume 68 Number 1, pages 114 - 117. These rare early boards have joins in the panels down the centre line. 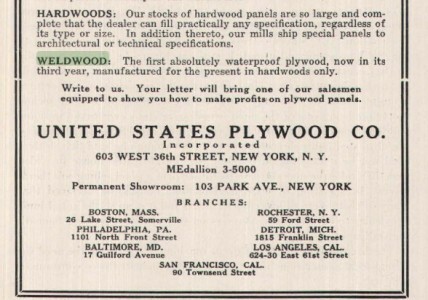 Sometime after 1933-1934, when reliable water-proof marine grade plywood (Weldwood, Harbord) became available, someone (possibly Tom Blake) was the first to replace the solid decking with a sheet of ply, either in constructing a new board or, perhaps just as likely, in replacing the panels on a damaged board. The advantages, including about a 50% reduction in weight in the panels, were significant and around 1936-7 Blake-Rodgers was the first company to successfully design, manufacture, distribute, and actively promote with adverting and plans a hollow timber and plywood surfboard. In plans dated 1937, reproduced in Lynch and Gault-Williams' Tom Blake: The Uncommon Journey of a Pioneer Waterman (2001), veneer or planking are suggested as alternatives for covering the deck and bottom of a Square-tail Hollow Board (fold-out, page 99?). And a reproduced brochure for Thomas Rogers Company, specifications for design numbers 4, 5, 6 and 7 are Mahogany side rails planked with Weldwood water-proof 3-ply panel (page 97). Blake worked with Rogers from 1932 to 1939 and the authors date this document circa 1934, however I feel it might be closer to the 1937 plans noted above. Hopefully, this answers your first question. However, I have added some further notes below on Weldwood and marine ply (1), although there is a good chance you are already familiar with most of the material. are you aware of any surviving Blake boards where plywood construction is definitely visible? In the background is a 12 foot 1930s hollow wooden Tom Blake-style surfboard. Generally, up to this point, advances in maritime technology were viewed with a conservative cynicism,and were only adopted after rigorous testing and experience. Before the outbreak of war, marine plywood was used to sheath canoes, small boats, and hollow surfboards and hollow surf-skis, with some designs available in kit form. The surf-ski was invented in Australian oyster-farmer, Harry McLaren, in the late 1920s; around the same time that Blake was developing his surfboard designs in Hawaii (note 3). The molded Haskell canoe (link above) and the molded small boat designs by Eugene Luther Vidal, featured on pages 25-26 of The Plywood Catalog of 1940 are particularly interesting (link below). The supply and application of marine ply vastly accelerated during WW2, famously for the superstructure of light-weight PT boats, and after the war a timber frame sheathed in marine plywood became a common design for constructing surfboards, surf-skis, canoes, racing shells and many small rowing and sailing boats. These were progressively superseded by laminated fibreglass and plastics. Best wishes for the success of your exhibition. Northeastern Retail Lumbermens Association, Rochester, N.Y.
Volume 14 Number 11 November 1935, page 47.
now in its third year, manufactured for the present in hardwoods only. Eugene Luther "Gene" Vidal (April 13, 1895 – February 20, 1969) was an American commercial aviation pioneer, New Deal official and athlete. He was the father of author Gore Vidal. For eight years, from 1929 to 1937, he worked closely with Amelia Earhart in a number of aviation-related enterprises. After leaving the BAC, Vidal experimented from 1937 to 1940 with wood-resin composites using a thermosetting polymer process similar to Duramold under the banner of the Vidal Research Corporation. The experiments with the durable waterproof plywood material, said to have a greater tensile strength than a comparable thickness of aluminum, evolved initially into a small business producing only trays and dinghies. Vidal patented the process as "Vidal Weldwood", variously described as "cooked wood" or "molded plywood." After the United States was drawn into World War II, Vidal obtained contracts to manufacture war materiel, primarily deck houses for PT boats, pontoons and aircraft drop tanks, that earned him the wealth that had eluded his earlier entrepreneurial attempts. Restrictions on the use of metals in 1942, particularly aluminum, caused by an increased demand by shipbuilders and aircraft manufacturers led both the Army and the Navy to demand designs for components and training equipment that could be manufactured from wood composites. Investments in factories to build Weldwood products under license boomed immediately. One such licensee was the Hughes Aircraft Division of Hughes Tool Company, and another was U. S. Plywood. The success of the product was well-publicized and earned him an honorary doctorate from Lawrence College. After the 1936 elections, (Amelia) Earhart began final planning for her proposed equatorial circumnavigation of the world, with fuel and routing across the Pacific Ocean major considerations. Vidal suggested that landing strips be built on tiny, uninhabitable Howland Island as the largest point of land along the planned route within range of both New Guinea and Hawaii. Earhart agreed with the suggestion and made the request for its use. It is alleged in Susan Butler's biography East to the Dawn: The Life of Amelia Earhart, and the possibility endorsed by Kathleen Winters in Amelia Earhart: The Turbulent Life of an American Icon, that Vidal had a long-standing romantic relationship with Earhart, from 1929 when they worked together for Transcontinental Air Transport to her disappearance in 1937. WELDWOOD WELDWOOD is waterproof Plywood. Its plies are welded together under heat and pressure with a phenol-formaldehyde binder (Bakelite type). This binder is not only waterproof but is chemically inert and is heat resistant up to the charring point of the wood used in the fabrication of the panel. Weldwood can be used outdoors for any purpose where lumber is usually required. It is suitable for siding, bill boards and other outdoor signs, farm buildings, truck bodies, trailers, store fronts, paneling for below-grade basements and boat building. In every instance in which Weldwood is used, it represents tremendous economy in labor. It is much lighter than any of the materials which it replaces and the finished job is far superior as it eliminates cracks and reduces joints to a minimum. WELDWOOD can be obtained from stock in Fir, Birch, Mahogany and Walnut. On special order, it can be obtained in practically any other wood. Boatbuilders and others requiring WELDWOOD for extra hard service may now specify "Marine WELDWOOD" for their jobs. The bond used in Marine WELDWOOD is identical with that used in standard WELDWOOD but this product is made with tight cores and "no patch" faces. The introduction of this special grade marks the final step in the perfection of WELDWOOD. An advertisement for Weldwood appeared in Australia in 1944 and two sheets of Waterproof Ply (14ft x 2ft x 1/4'') were specified in plans for a Blake-type hollow board prepared for the Surf Life Saving Association of Australia in 1945. However, marine plywood was probably available in Australia well before this time. Lack of a waterproof adhesive that would make plywood suitable for exterior exposure eventually led automobile manufacturers to switch from plywood to more durable metal running boards. A breakthrough came in 1934 when Dr. James Nevin, a chemist at Harbor Plywood Corporation in Aberdeen, Washington, finally developed a fully waterproof adhesive. This technology advancement had the potential to open up significant new markets. But the industry remained fragmented. Product quality and grading systems varied widely from mill to mill. Individual companies didn’t have the technical or in most cases marketing resources to research, develop and promote new uses for plywood. Thomas C. Jester (editor): Twentieth-Century Building Materials: History and Conservation, 2014, page 102. However, as a recreational craft the canoe captured the imagination of Europe following the publication of John MacGregor’s best-selling A Thousand Miles in the Rob Roy Canoe in 1866. A clinker oak hull with a cedar deck, the original Rob Roy canoe, built in 1865 by Thames boatbuilders Searle & Sons of Lambeth for John MacGregor’s tour of Europe, is now preserved at the River and Rowing Museum, Mill Meadows, Henley on Thames, Oxfordshire. Around the turn of the 20th century canoe builders used standard plywood laminated between layers of painted canvas to produce a lighter craft, before the introduction of relatively inexpensive marine grade plywood in the late 1930s. After the WW2, recreational plywood canoes were ubiquitous on the lakes, rivers and bays of Australia, often available from boat-hire services at resorts, before they were progressively replaced by fibreglass canoes during the 1970s. With the coming of the 21st century, plastic molded canoes dominate the recreational market. Frank and Betty Cater and plywood canoe, Patonga NSW, 1950. In 1935 Amelia Earhart wrote an article My Flight from Hawaii, published in National Geographic, May 1935. The magazine also contained eight surfing photographs at Waikiki by Tom Blake, including one of Amelia riding in an outrigger canoe. Easier to handle than the tricky board, the canoes offer good fun. When the surf is not too big, gay parties, sometimes as many as seven in a boat, may be seen riding the waves in these queer craft, which are hollowed koa logs, with side floats to prevent capsizing. At the steersman's signal all paddle furiously till the swell lifts them and bears them fast toward shore. Lashed together anil provided with woven grass sails, such vessels have been used by natives for long ocean voyages. Published by Manly Life Saving Club, NSW Printed by Publicity Press Ltd.
Doubleday and Company, Inc, Garden City New York. 1998 Second edition by Benedikt Tashen Verlag GmbH, Hohenzollernring 53, D-50672 Koin. Tom Blake's Hawaiian Visits 1925 to 1950. Notes by Judy Blake, 2007. "FYI. Very interesting details recently unearthed by Judy Blake." I've been meaning to get back to you on some info (interesting but not earth shattering) I discovered on Frances E. Cunningham Blake. She was born in Bartlesville, Oklahoma on July 8, 1907 and was 1/8 American Indian. Frances must have been very young when she married Tom. She and Tom were passengers on the Calawai which departed from Honolulu, Hawaii and arrived in San Pedro, California on Dec. 12, 1925. Frances was 18 and Tom was 23 at the time. Frances' parents, Alfred and Laura Cunningham were each 1/16 American Indian. Her older brother, Edward was 14 years her senior. I don't know what happened to her dad, but Frances and her mom were living with the Lombard family in Los Angeles in 1920 and Edward was still on the ranch in Oklahoma. Robert Lombard was her mom's brother. Frances was 12 years old when the 1920 census was taken. I cannot find Frances (Cunningham or Blake) on the 1930 U.S. census. Either her name was misspelled, she was not counted, or she had died or remarried when the 1930 census was taken. I have records of a few other return trips Tom had made from Hawaii but Frances was never on the passenger list. Tom was on the list of the Calawai when it arrived in Wilmington, Ca. on Nov. 1, 1930. He was aboard the ship, City of Los Angeles on Oct. 2, 1931 on it's arrival in Wilmington. On June 18, 1932, he traveled on the Calawai from Honolulu to Los Angeles. Tom arrived in Los Angeles aboard the Lurline on March 6, 1937. The next record I have of his arrival from Hawaii was on July 16, 1941 on the ship, Matsonia. He just missed the bombing of Pearl Harbor. The final passenger list I found with Tom's name was from the Lurline on April 17, 1950. Right after my last email in November, my mom was diagnosed with terminal cancer. She died on Dec. 18. My dad is still having a difficult time coping with the loss. They would have been married 65 years next month.